The last few months have been surreal. Since Michael Brown's murder in August, the calls for justice in his death and the deaths of others have only gotten louder and more insistent. The Grand Jury's decision NOT to indict Darren Wilson, the officer responsible for his death, has created a significant push-back against the way Black lives are valued (or de-valued) in this country. With that in mind, we look towards the work that remains to be done once the marching ends. We have some house cleaning to do to hold ourselves accountable for addressing our own internal issues. To that end, we begin with a set of guiding principles that will govern how we treat each other within our own communities. 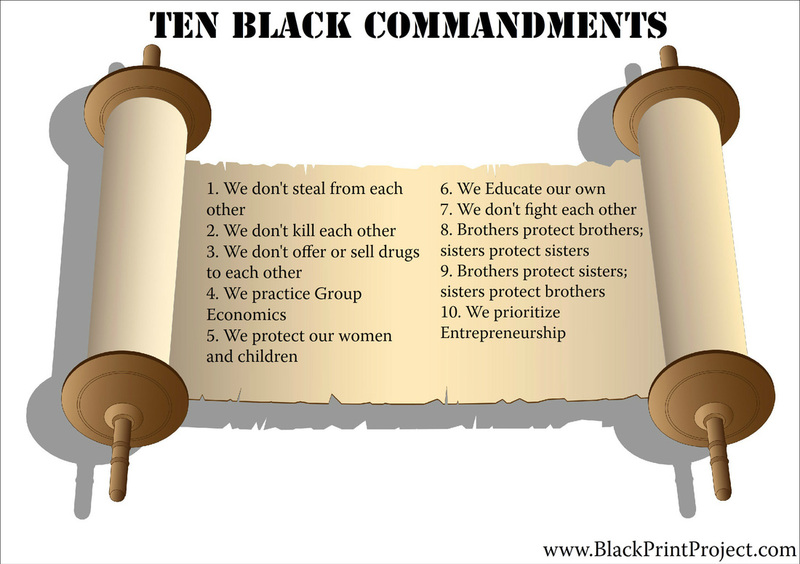 Black Commandment I: We DON'T Steal From Each Other. This is simple. In order for us to move forward as a collective, everyone has to be able to trust their neighbor. This is simply about establishing trust amongst ourselves. Black Commandment II: We DON'T Kill Each Other. A lot of noise has been made by people who point to "Black on Black" crime whenever we become critical of the "Justice" System. We'll deal with that another time. The rule here is simple. All Black lives matter. Especially, to each other. Black Commandment III: We DON'T Offer Drugs to or Sell Drugs to Each Other. This should be automatic. Drugs are poison. A majority of Black people in the penal system are there for non-violent drug offenses. We will no longer peddle poison to our own people. Black Commandment IV: We Combine Our Dollars and Buy AS A GROUP to Maximize the Impact of Our Dollars. The simple reality is, in America, economic resources are required to undertake and sustain any movement. We will understand and practice the principles of Group Economics. Our progression as a people will be wholly dependent on our economic empowerment. Black Commandment V: We Protect Our Own Women and Children FIRST. The saying goes, "It takes a village to raise a child." We must get back to the community approach to taking care of the most vulnerable of those among us. Black Commandment VI: We Educate Our Own Every Chance We Get. Let's be honest. What passes for education in this country is simply an indoctrination in the White Supremacy mentality. We learn only enough to help them maintain the status quo. We will commit to ensuring that the education of our children BEGINS and ENDS at home. And we will each commit to a life time of seeking knowledge. Black Commandment VII: We Don't Fight Each Other. A house divided against itself cannot stand against its enemies. We unite with the understanding that in order to battle against a coordinated effort to oppress us, we have to be of one accord. We pledge to handle any internal issues out of the public eye, and without violence against our brother. Black Commandment VIII: Brothers Protect and Build Up Other Brothers. Sisters Protect and Build Up Other Sisters. I AM my Brother's/Sister's Keeper. Nuff said. Black Commandment IX: Brothers Protect and Build Up Sisters. Sisters Protect and Build Up Brothers. The Black man and woman have been at odds for far too long. Perhaps the most insidious impact of the legacy of slavery has been the lack of trust between us. That will no longer be the way forward. The paradigm must shift and we must be accountable for each other's empowerment. Black Commandment X: We Look For Every Opportunity to Start Our Own Business Servicing the Needs of Our People FIRST. As a collective group, Black Americans will spend $1 Trillion in 2014. We will make it our mission to invest in our own businesses and to improve the economic fortunes of our communities. Ultimately, we have a lot of ground to cover in the fight for equity and justice. It is absolutely necessary for us to understand that we can only progress when we hold ourselves accountable for how we treat each other. Anything less and we are complicit in our own oppression.